No Christmas would be complete without a themed RBC movie review â€“ but this season, instead of the usual film recommendation, weâ€™re going with a straight-to-telly BBC Special. 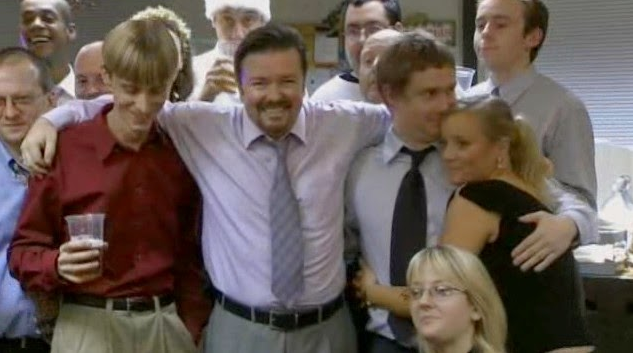 Itâ€™s the beautiful, bittersweet, and downright painful final send-off to the UK version of The Office. To enjoy the Christmas special itâ€™ll be fine if you havenâ€™t watched the first two seasons (even though you must have been living under a rock). But everything about this powerful ending to the show plays with the investment an audience has made with each of the charactersâ€”whether out of sympathy or pity. The two-part special picks up three years after season two concluded. Exactly as should be the case, everyone is still miserable. 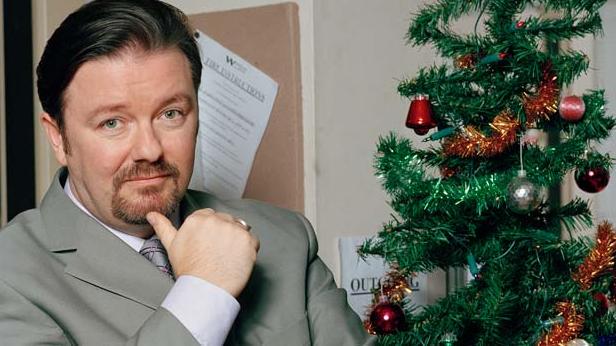 By day, David Brent (played by Ricky Gervais) is now a traveling salesman. By night, he ekes out a living as a Z-list celebrity, cashing in on the fame of his failed documentary (which we assume was the aired material from seasons one and two) and an embarrassing music career (see the video at the bottom of the post). He makes frequent visits back to his old office at Wernham Hogg, nominally to boost employee morale, but itâ€™s clear heâ€™s merely hiding his own deflated spirits. Davidâ€™s former protÃ©gÃ© Gareth (played by MacKenzie Crook) is now the boss, and neither he nor Davidâ€™s nemesis Neil is too pleased with Davidâ€™s appearances. Tim and Dawn are still not together, as he (played by Martin Freeman) is still in the same dead-end job he complained about back in season one, and she (played by Lucy Davis) is now in Florida with her schmuck of a fiancÃ© Lee. Wernham Hogg arranges to host a holiday party that will re-unite all the old cast of characters. Poor David, however, is in the sticky position of having to arrange a date with very little time to spare. David Brent on a blind date is exactly as awful as hoped, so we’re treated to not just one failed attempt, but multiple. Although Gareth is now in the big man’s chair, his previous desk across from Tim is now occupied by an equally loathsome employee named Anne. It seems no-one is going to be in a good mood for the festivities. But although the Christmas special kicks off in the same dreary mood that characterized the television series, it eventually takes on a very different feel. Gervais and co-writer Stephen Merchant (responsible for some other wonderful comedy thatâ€™s been praised here at RBC) wrap up the loose ends magnificently: Dawn and Tim figure out that they really are meant for each other; David summons the courage to stand up to the bullies who call themselves his friends; and the whole group warmly takes a photo together while David tells a joke that actually makes them laugh. In an interview, Ricky Gervais once referred to his frustration about having acquired fame and success relatively late in his career. He mentioned that this frustration dissipated upon realizing that The Office worked well only because he and Stephen Merchant had spent so many years in jobs filled with the drudgery that the show ridiculed. Itâ€™s the cuts to a printer printing multiple copies between scenes, or someoneâ€™s petty obsession over their favorite stapler, or the desperate search for any excuse to walk to a friendâ€™s desk and make small-talk that bring Gervais’s and Merchantâ€™s world to life. Without belaboring the comparisons to the American version in much detail (that conversation is usually an unhelpful distraction; both shows are fundamentally different), this is why I prefer the UK version of the show â€“ for the plain reason that despite the oddity of characters like Gareth and David, thereâ€™s still something believableÂ and relatableÂ about them. This is much more than I can say for their American counterparts. Iâ€™ve met Gareth Keenans and David Brents before, and I regularly meet Tim Canterburys and Dawn Tinsleys.